May 13th is Frog Jumping Day. As the name of the date states, frogs jump, but they have many other ways of moving around. If we humans applied these methods to our daily routine, we might lose weight. Here are 4 things frogs teach us about slimming down. Frogs jump, run, walk, climb, glide, and swim to get around. Doing a variety of workouts gives your body a chance to heal. Working a set of muscle groups one day and working a different set the next day allows your muscles to recuperate and recharge. This can reduce the risk of injury. Varying the routine also helps you get the most out of your routines. Bodies tend to plateau if you only have one method of exercise. We need oxygen to produce energy – every move we make requires oxygen. Frogs breathe constantly. They have lungs, but they also take in oxygen through their skin when they’re under water. 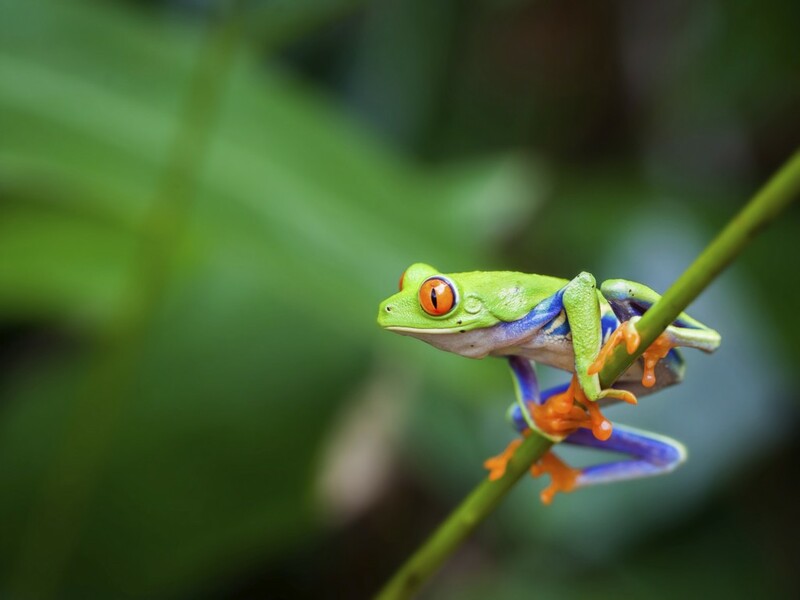 While frogs breathe involuntarily, it can be voluntary or involuntary for humans. When we put in a hard workout, it’s sometimes hard to breathe enough involuntarily, so we have to remember to breathe voluntarily to maximize our energy and workout. Unlike humans, frogs use their tongues and teeth to grab prey rather than to chew and swallow their food. Frogs use their eyes to swallow food. The eyes retract into their heads to help push the food down their throat. 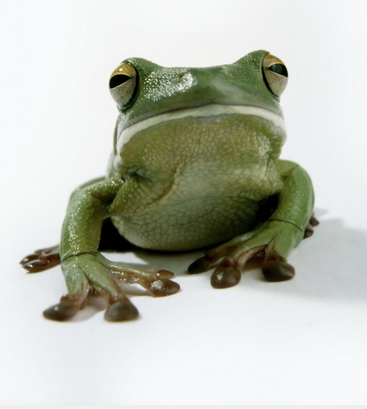 This is why it looks like frogs are blinking when they eat. Human eyes don’t have the capability to sink low enough to help us swallow, but eating with our eyes can help us stay trim. A study published in the journal Appetite shows people will likely enjoy food more if looks appealing. So if you make your chicken and broccoli beautiful and make your pizza look unappetizing, you’ll likely make the healthier choice. Frogs need water to keep their skin slick which protects them from everything – as a guard against bacteria to making them too slippery for predators to hold on to. It’s not a surprise frogs use a lot of energy to stay hydrated. 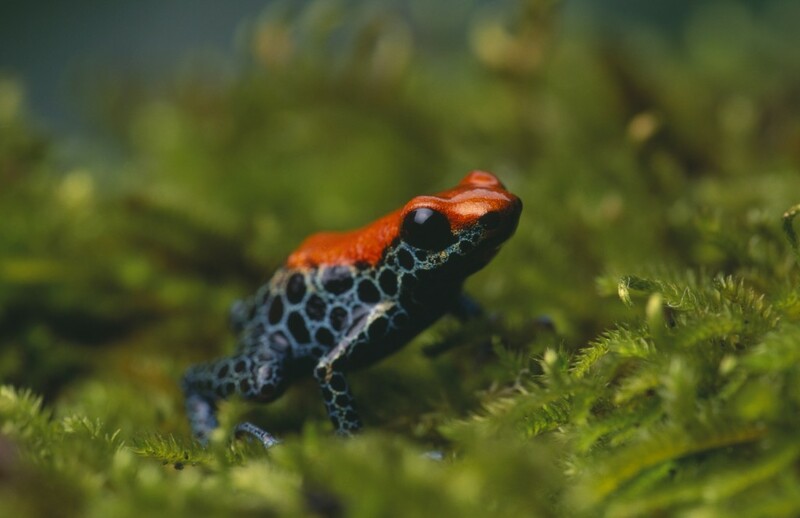 Some frogs are nocturnal to avoid water loss; others secrete a waxy coating to prevent water loss; some even have a special stance that slows down evaporation. While humans need water to keep organs functioning and to stay alive, we don’t have the same sort of defense mechanisms on auto-pilot to keep us from losing water. A day in the life of a frog may be the reminder we need to have another glass of water. Frogs are amazing little creatures. They might not be wise, we can learn a lot from them. How to Reduce Flabby Arms | Shh!! Momma's Writing!